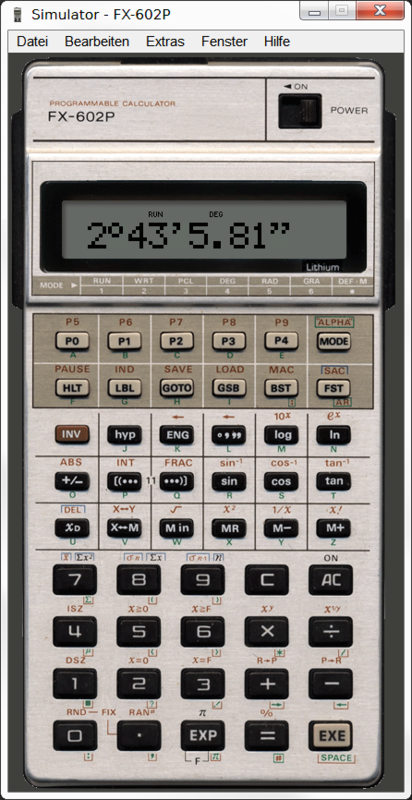 FX-602P Simulator is a very precise simulation of the classic FX-602P programmable calculator and and all it's accessories. 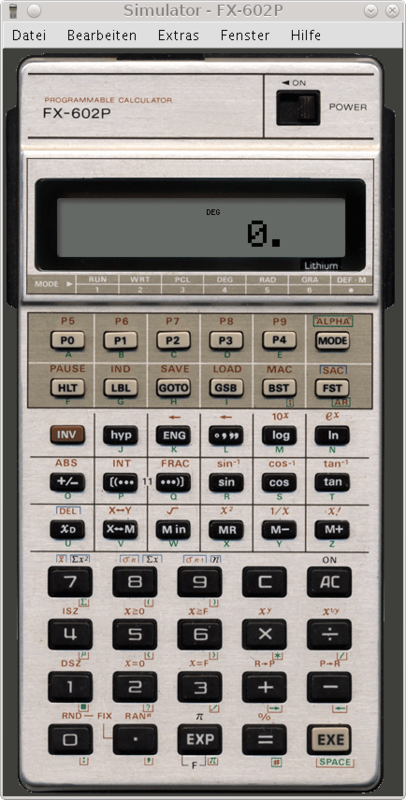 The FX-602P simulator supports all arithmetic, trigonometric, logarithmic, hyperbolic, statistical functions and all alphanumeric display options of the original calculator. 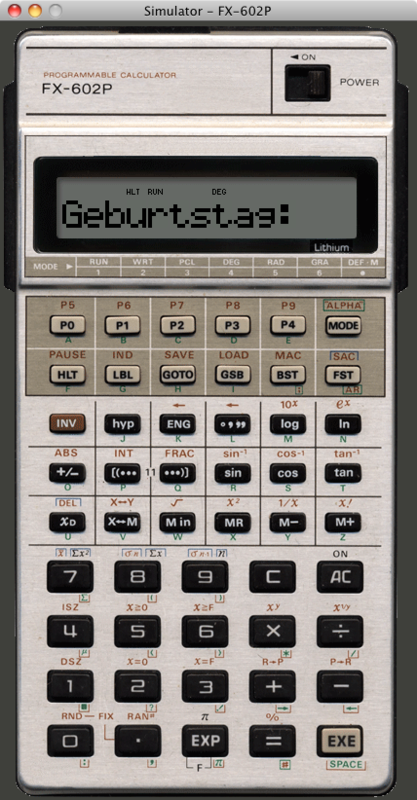 The mathematical functions are implemented using a powerful 18 digits BCD floating point library and precision generally exceeds those of Java doubles or the original FX-602P. All numbers are rounded to 10 digits before display. The FX-602P Simulators is fully programmable just as the original was. All features including indirect addressing or alphanumeric display are implemented. 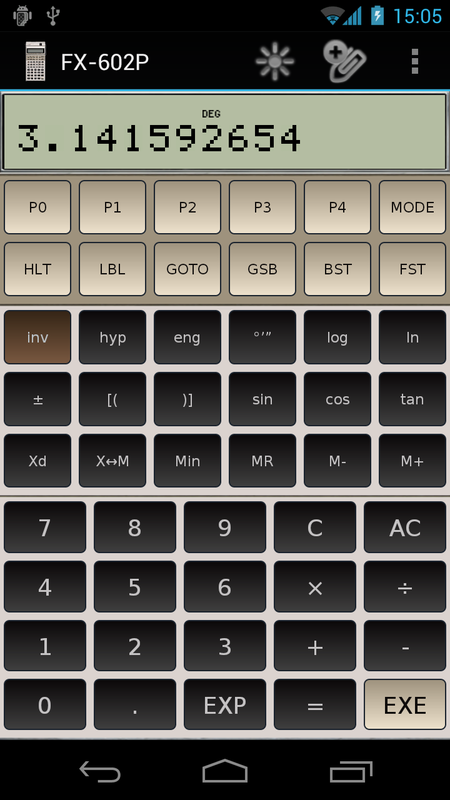 Memory wise the Simulator exceeds the original Calculator: The amount of available program steps has been raised from 512 to 999 and the amount of memory register can freely chosen between 11 and 110 – without loosing any program steps. Program steps and memory register saved when the simulation ends or goes to sleep. The FX-602P Simulator also simulates the FA-2 cassette interface. Of course instead of saving program steps and memory register to a cassette tape (using the Kansas- City-Standard) the data is stored in permanent memory (hard drive, flash memory) on the host computer. Care has been taken to use the same file format as it was used with the original Calculator. Using a program which converts Kansas- City-Standard sound files into normal binary files it should be possible to exchange programs between an original FX-602P and the FX-602P Simulator. As of Version 2.0 the FP-10 thermal printer is also simulated. Printout can copy / pasted into other applications. fx-601p: download free demo from one of the shops below or from Sourceforge. Note that the Windows version needs Java which is not available in Windows Phone. Download link will be send by E-Mail - make sure to add a current E-Mail address. Paypal orders are processed manually please allow up to 48h for processing.